Straight out of left field and completely unrelated to recent content on this blog is an article showing how to convert audio files from one format to another including from MP3 to WAV and WAV to MP3. So the reason I am writing this guide is that I had to convert some audio files at the weekend really quickly (more of a want than a need really). Last week I was given an Amazon gift card and so I used some of the money to update my music collection. I downloaded the files straight to MP3 as opposed to buying the CDs and waiting for them to be delivered. On Saturday mornings I take my daughter swimming and I felt the urge to subject her to an eclectic mix of “Chas and Dave”, “Brian Setzer”, “Louis Jordan” and “Cab Calloway”. Hey that is what dads are for. I had fifteen minutes before we needed to leave and I realised that I had to burn the songs onto a CD and what is more I needed to convert them from MP3 to a format a standard CD player can play such as WAV. In this article I am going to show you the method I used to convert the files and then I am going to show you the easy way. I used a command line tool called mpg123 to convert the MP3 files to WAVs. Now obviously when you are time limited and because you would drive yourself insane having to type in each and every filename it is better to write a script to convert all the files. For a complete script that you can use again and again click here. This script works perfectly well and will work on any distribution that has mpg123 available. This is the Everyday Linux User website and the point of this site is to make it easier for the average user and is not for command line wizards. 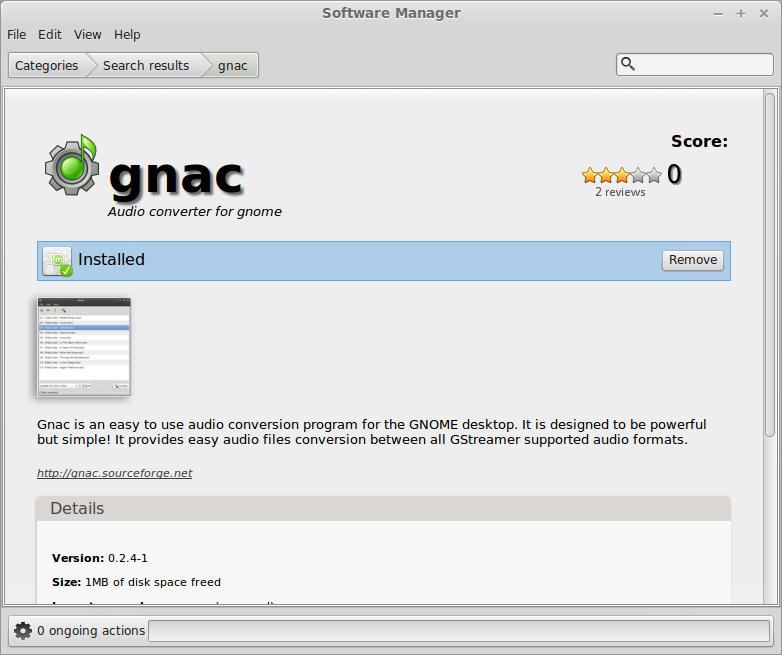 There is a Gnome based tool called “Gnac” (Gnome Audio Converter) which is perfect for the task and is really easy to use. You can install “Gnac” from the Mint Software Manager by simply searching for it. The reviews aren’t very inspiring. There are just two of them. 1 for 5 stars and 1 for 1 star. 1 person said it worked perfectly and 1 said it didn’t work at all. Once it has been installed “Gnac” can be loaded by clicking on the menu and searching for it using the search bar. “Gnac” is very easy to use. Clicking the “Add files” button brings up the standard “open a file” dialogue. You can select individual files or select a folder. Selecting a folder loads in all the valid audio files within that folder. If you add files by accident you can remove them by clicking the “Remove files” icon. Got it completely wrong? Simply clear the list by clicking the “Clear files” icon and start again. There is a dropdown in the bottom left corner which shows what the file will be converted to. By default WAV is selected which in this case is exactly what is required. Clicking “Convert” either on the toolbar or in the bottom right corner of the window starts the process. The conversion takes a matter of seconds to complete. Converting from WAV to MP3 used to be a common task as people used to buy CDs and then convert them for use on their computers and MP3 players. Most people probably download more music than they buy on physical disks and so it is more likely that they want to convert the other way around now. 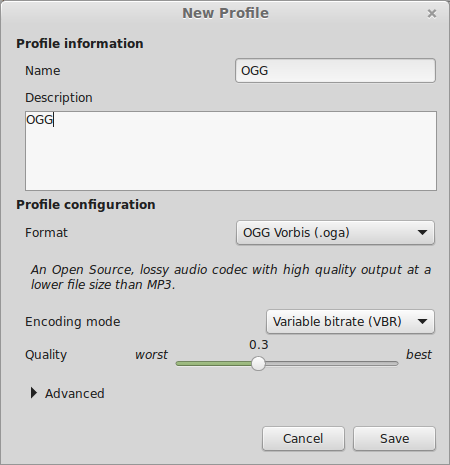 “Gnac” can convert to multiple formats and so if you need to convert from WAV to MP3 you can. The file format dropdown box can be set to have other formats as well. Click the “Edit” button to add new file formats. When you use “Gnac” for the first time there is only “wav” listed. To add new file formats click on the “New” button. The Name and Description fields are there for your benefit to describe the format that you are adding. You might choose to have 3 MP3 formats all with differing quality settings. It is therefore a good idea to use the “Name” and “Description” fields wisely to define the format that you are adding. 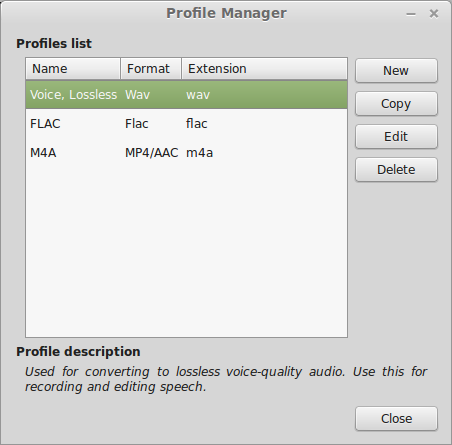 The “Format” dropdown provides a list of possible conversion formats such as FLAC, OGG, MP3 and M4a. The quality setting determines how much quality you lose during the conversion. If you use the highest quality the file size will be bigger and therefore of course a lower quality file will have a smaller file size. The “Advanced” options lets you choose bit rates and the number of channels (mono/stereo). When you are happy that you have set the format the way you want it click on “Save”. From the “Profile Manager” screen you can copy a profile. This is useful if you have for example an MP3 format but you want another one with a higher or lower quality. To amend a profile click it within the list and click “Edit”. Finally, to delete a profile select it and click “Delete”. When you return to the main “Gnac” interface you will now be able to choose your required format from the dropdown. Most of us listen to music digitally nowadays and so converting from one format to another probably doesn’t happen all that frequently anymore. If you need to create an audio CD for use in a car stereo (some of us still have older cars) or you have an audio CD you need to convert to MP3 then “Gnac” is perfect for the job. Of course the annoying thing is that with seconds to spare I managed to get in the car and insert the CD into the stereo only to find out that printed in bold writing were the words “MP3 Audio”. Raspberry PI frustrations and Why Windows 8, Why? If you have any CD's try Asunder. Windows have programs that take MP3's and make standard audio CD's. There must be something like that for linux. I never looked into it since I haven't had a need to create an audio CD in years. Brasero and K3B record audio CDs directly from MP3s. No need to convert. I use this function every day! and thanks for the script. My k3b wouldn't add MP3's and this script got me out of trouble.